San Diego has played an important role in American aviation history. Indeed, some of the earliest attempts at controlled flight have occurring here. 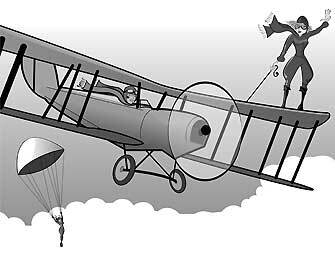 While most historians recognize the pioneering work of Montgomery, Curtis, Ryan, and Lindbergh, most ignored the role women played in San Diego’s aviation history. Alex Bevil – the California State Parks Historian – will focus on the untold story of San Diego’s female aviators within the broader context of the history of women’s aviation. Faced with gender bias, ridicule, and sometimes even outright sabotage, these “First Ladies of Flight,” whether they realized it or not, were pioneer feminists. All possessed a single-mined determination to fly, often paying the ultimate price for their efforts. Come join the OB Historical Society and friends on Thursday. See the OBHS website.